The officer allegedly wouldn't let him enter Malaysia without "some kopi money." In his, now viral, lengthy Facebook post, Fauzi described an ugly experience he had with an Immigration Officer at the Sultan Abu Bakar CIQ Complex in Johor Bahru. 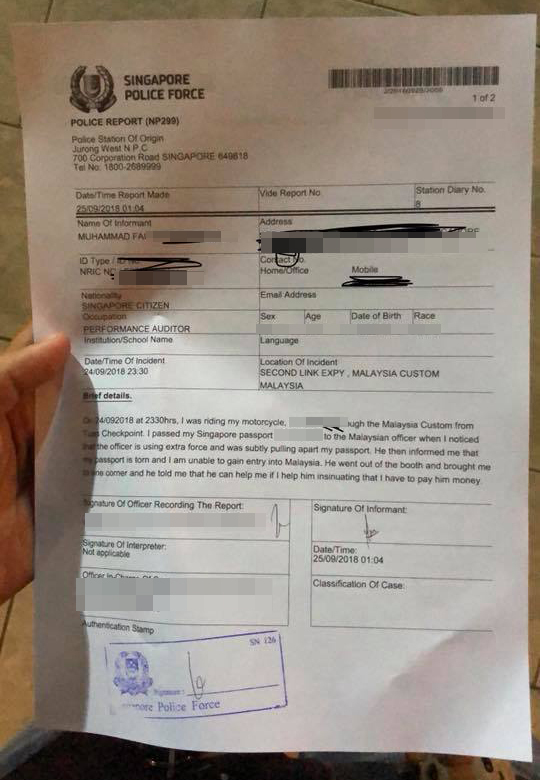 According to Fauzi, the Malaysian immigration officer, who wasn't named, allegedly demanded a bribe after tearing his Singapore passport to let him enter Malaysia. However, the Immigration Officer at the JB CIQ questioned Fauzi about the Malaysia Automated Clearance System (MACS) Pass on his passport, and what was he doing entering Malaysia so late at night. Fauzi claims that he told the officer that he was on his way to home as he stays in Malaysia and his wife is waiting for him. It was at this point that things took an ugly turn for Fauzi. "Oh, you have to U-turn back to Singapore because your passport is torn. 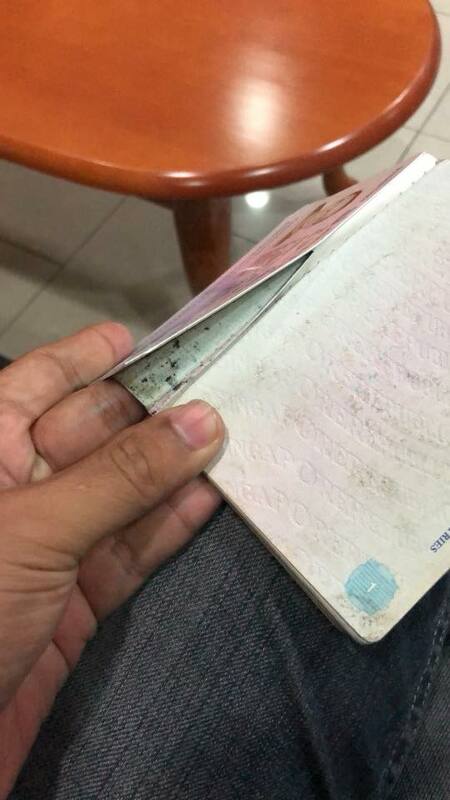 Unless you're a Malaysian, I can't allow you to pass through but right now that passport is torn and it is illegal," the Immigration Officer allegedly told Fauzi, who added that he was shocked to hear the officer say that because he knew his passport was perfectly fine. 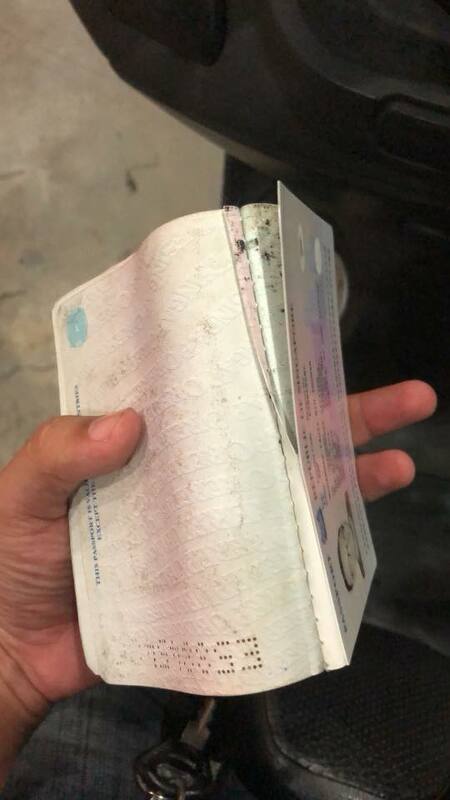 "I had to use it every day and even a few minutes before giving it to the officer, I had to scan my passport in SG custom. It was perfectly fine, no tear no bend no scuffs," Fauzi wrote on his post, which at the time of writing this story was shared over 11K times. "Bro, I can help you pass through and let you see your wife but if I help you, you need to help me too," the Immigration Officer allegedly told the Singaporean man. Sensing as to where this was going, I asked, "What do you need me to help you with?" He replied, "Oh, like this also need me to spell it out and teach you?" "Oh, so you want money? Money in your pocket will let me through?" "Ahh smart boy," the officer replied, Fauzi claims in his Facebook post. I immediately told him, "Tell you what, I will take back the passport you tore and I will go back to Singapore." At this point, the officer simply smiled at him and told him to make a new passport before he can go back home, Fauzi wrote. After Fauzi went back to Singapore ICA at Tuas, officers there told him that he wasn't the first person to experience what had just happened. They then advised him to lodge a police report. "If you do experience the same, please report it as well," Fauzi wrote on his Facebook post, advising his fellow Singaporeans. "Both to Singapore and Malaysia police". According to the latest update on his post, officers from ICA Tuas assisted him in arranging a meeting with Malaysian Immigration Personnel. "Because of this viral post, I’m grateful that things were expedited and that the corrupted officer was reprimanded and under surveillance," Fauzi added. He also advised others to not be afraid in case they experience the same thing, adding that cases such as this cannot be resolved or improved upon if it goes unreported. The video has been viewed close to 600,000 times since it was posted on Sunday, 23 September. Eating excessive amounts of lead can affect the brain and central nervous system.